The set-up of this book is very much like many noir stories; our hero is visited by a pretty woman from his past because she wants him to do a job. But this book has a pretty infernal twist on that scenario. In this case, our hero is Hector "Heck" Hammarskjöld, an ex-football player who became estranged from his father, coming home only after the old man's death. What he found was that his father was a mystic and that there was an opening to Hell in his house. Heck turns this circumstance into a vocation, going into Hell to retrieve secrets and messages from the damned for a price. In this book, Heck is approached by a girl he had a crush on in high school, Amy, whose husband was a thief and a philanderer who died in a horrific and suspicious car crash. She has a question for him, and contracts Heck to go ask him. Heck and Elliot, a former waterboy and current friend/associate go into the infernal realm, which takes Dante's conception as its model, and they are tested beyond belief. They had forgotten just how much an ordeal going through Hell is, even for the living who do not belong to the place (yet). Eventually, the place tests their resolve, sanity, and very being. In the end, however, they both realize insights about themselves, and the ending took me a little by surprise (in a good way). This story first appeared in installments in one of my favorite publications of the past year, Double Barrel. This anthology series was created by Zander and Kevin Cannon (who are not related to each other) to showcase a couple of serials, this one and Kevin's Crater XV, as well as some shorter works and a series of advice columns for making comics. Both of the main serials are excellent, and I am particularly taken with how Heck takes familiar scenarios and genres and bends them into a thoughtful, dark, suspenseful, and well-plotted tale. Zander Cannon began this book as a 144 Hour Challenge, an experiment in creating 12 comics chapters over a year by drawing once a month in the space of 12 consecutive hours. Time and circumstances led Zander to abandon the experiment, but he continued with the narrative, drawing it out into a longer and more satisfying length. The latter chapters definitely seem less rushed and are better composed and clearer than some of the earlier ones. Still, I think the book is very well presented throughout, and this is one of my favorite works from the past year. 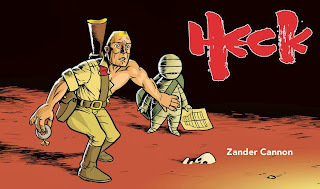 Zander Cannon has produced a number of graphic novels with Kevin Cannon, including Evolution in collaboration with Jay Hosler, The Stuff of Life with Mark Schultz, and T-Minus with Jim Ottaviani. He also created his own series The Replacement God and worked with Alan Moore on the series Smax. He speaks more about his work on Heck in this interview. Cannon is an award winning comics creator, and his work here has received much praise. John Seven wrote, "you can enjoy the action and adventure and humor, but there is something at the core of Heck that runs deeper than any of those." Mark Flowers wrote in admiration of some of the cheeky aspects of the book, but added "at heart this graphic novel is a serious morality play, with the conflicted relationship between Elliot and Heck (who feels responsible for Elliot’s condition) at its center." JK Parkin summed this book up as "pretty awesome." In short, it has effective action and mystery elements, but it also has great heart. A preview and much more is available here from publisher Top Shelf.